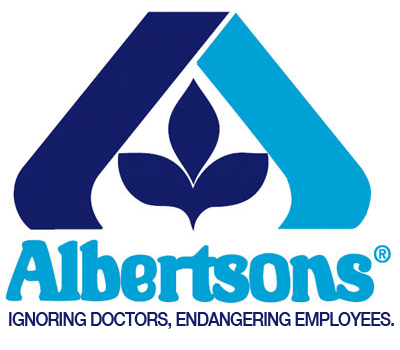 Courage Campaign | Albertsons Grocery Stores: You MUST protect pregnant employees! Albertsons Grocery Stores: You MUST protect pregnant employees! Tell Albertsons CEO Robert Miller: "You MUST protect pregnant employees! Enforce policies and follow the laws that protect every pregnant employee and her baby, and immediately fire any supervisor who does otherwise." Reyna García, a 30-year-old woman who works for the California grocery chain Albertsons, lost her child when supervisors ignored multiple letters from her doctor over a period of months stating she had a high risk pregnancy and could not handle heavy lifting. One day, she asked to leave work while in pain, but her request was denied and she continued her heavy lifting duties, afraid of losing her job and her insurance from Albertsons. When she went into labor that night, she found out that her baby was losing fluid and sustaining brain damage. She gave birth two days later, but the baby only lived for a few minutes. Shame on Albertsons. Demand that Albertsons CEO Robert Miller enforce policies and follow the laws that protect every pregnant employee and her baby, and immediately fire any supervisor who does otherwise.